Easy pose, or sukhasana, is one of yoga's foundational seated postures. The legs are crossed and the feet rest underneath opposite thighs. 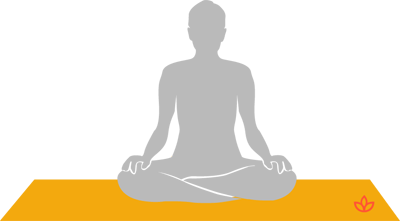 It is often used as a resting pose or a meditation posture in itself. Sit with your legs stretched out. Exhale and bend your legs, tucking each foot under the opposite thigh. Reach the crown of your head upward. Rest your hands in your lap. Close your eyes. Breathe normally while holding the pose.